The All-New, completely redesigned Blade 49R now features the most powerful engine in any pocket bike. This Honda®-Based 4-STROKE race-tuned engine is a first for any pocket bike this size. 4-STROKE engines are quieter and more powerful while also being more fuel efficient. Once you've ridden a pocket bike with such monstrous torque and high-end power, you'll never go back to 2-stroke motors again. Easier starting, less emissions and no more mixing gas and oil. Just like it's Super Pocket Bike siblings, just add gasoline and ride! Mated to a CAD (Computer Aided Design) race-proven frame and longer wheelbase, the Blade was designed for fierce handling on tracks and roads other pocket bikes could barely handle. From its Treaded Racing Tires to the redesigned handlebar setup, this pocket bike will reward its rider with tenacious grip and superb handling in side-to-side transitions. Unique fairing colors, a low-slung aerodynamic profile, aggressively treaded racing tires and a pulse-tuned straight-pipe exhaust system sets the Blade apart from other pocket bikes. Riding position can be adjusted to fit each racer perfectly through fully adjustable handle bars (width, angle, height), brake / throttle sensitivity, user-adjustable top speed limiter and tire pressure. 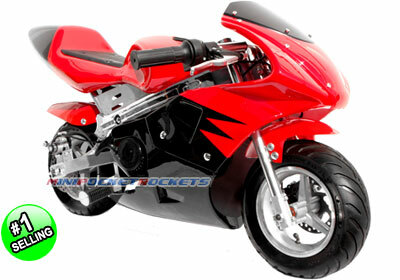 This pocket bike comes virtually fully assembled and ready to race. EPA APPROVED & CERTIFIED - OUR POCKET BIKES ARE THE ONLY ONES LEGAL IN ALL 50 STATES! Included Free with Pocket bikes: Bike Kick Stand, Tools, Tool Case, Motor Oil Bottle, Owner's Manual, Starter Stickers and our free extended warranty.